Because we already took a look at the loading screens in Part 1, we will skip that bit now. And even if it had been included here, it would not have had any effect on the final scores due to this blog's established tradition regarding loading screens and other graphics. Instead, we start by looking at the menus. 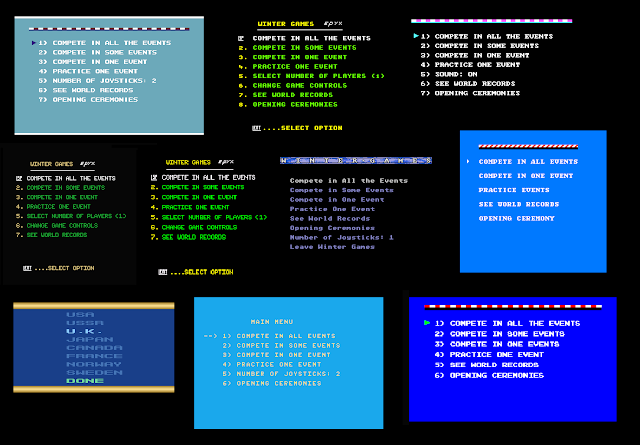 Although it has no seriously graphics-heavy information on screen in any version, it should be noted that you will be looking at the basic colour scheme and setting of the main menu between every event, and consequently, for quite a long while. When all other excuses fail, at least you can very clearly see here the difference between Atari 2600 and all the others. The first thing that you see after the game has loaded, should be the opening ceremonies, although it just isn't in all cases. 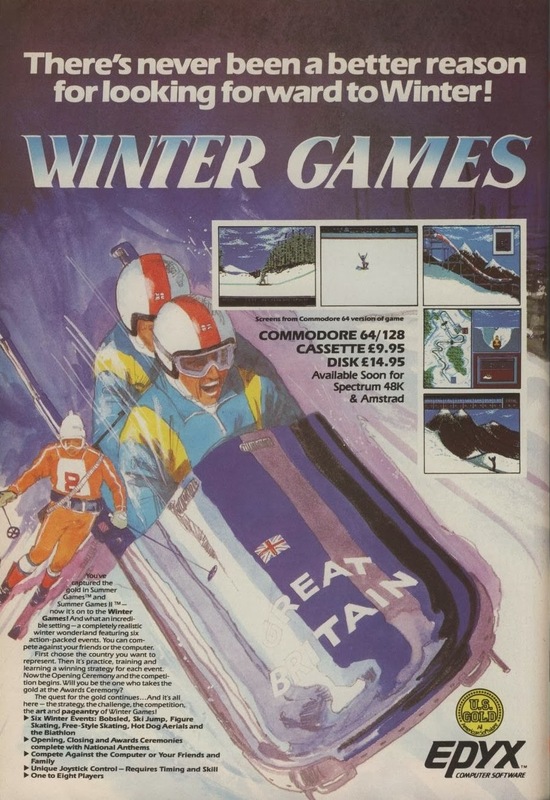 As you might have guessed, the Atari 2600 version is one of those missing a proper opening sequence, and instead has the lightly animated olympic torch in the title screen. The other versions that don't have any sort of opening sequence apart from the loading screen are the Spectrum and MSX versions. Strangely, though, the Amstrad version has a completely different look on its opening ceremony - sort of 3D'esque in a strange way. The animation is not too bad, so it's a nice exception in the form. As for the rest of the Ataris, the 7800 follows the original's pattern, and has a very similar look in the sequence, whereas the ST version has a similar look as the Amiga version, naturally being graphically as enhanced as its competitor. Both are animated very well, seriously giving their competitors a run for their money. The Amiga version differs only where the fire animation is concerned - it looks more natural on the Amiga. You can see a screenshot from the Amiga version in Part 1. In the picture above, we see the original alongside two very similar takes on the opening sequence. Clearly, the C64 looks the best with the hi-res sprites and sharp colours, whereas the DOS version bears the CGA palette in its usual way, and the Apple ][ has a problem with dots and blocks, not to mention some of the colours. Still, not too bad. The big catch is in the hardware, really. If your DOS machine is too powerful, you will not be able to see much of the ceremony because it runs too fast - although the game itself has no problems with that. Then, the Apple ][ has a flickering problem. The only thing I can think of that the original C64 version has a bit awkward is that the doves are completely white, and it's hard to see them in the screenshot - it's better to see it in action. But then again, it's a problem most of the versions share. The NEC picture has a strange interlaced mode that I am unable to get around on the emulator, although I cannot say for sure if this is how it looks on the real thing. Apart from the interlaced effect, it actually looks rather good - very close to the original in detail, although not in colour. The NES version looks squeezed up, in order to fit the picture on an NTSC screen - the game was never released in PAL regions. It also has that character fault that NES games usually have, that most of the background graphics looks patterned and unnatural. Even the torch carrier looks like a stiff brick, instead of a person. The lack of detail is truly astounding for a console of such high reputation. Putting these in order would be unfair for the versions that don't have an opening sequence, so I will just say that the best two are on the two Commodore machines and leave it at that. No points will be given at the end for this. As it is the first event in the original version and many others, we shall start with Hot Dog Aerials. Only being called in the game as such on the NES version, this is the full name of the event as written in the manual. That aside, this event has an unusually wildly varying background and overall colouring, not to mention the character animation and other minor stylistic choices. Here you see the original version, featuring your hi-res sprite of many colours having no problem being placed on top of a multi-coloured lower-resolutioned background. Because of the mountains' primarily brown colouring, they melt into each other nicely, creating a nice background that you like to have there, but mostly ignore, because it's background. 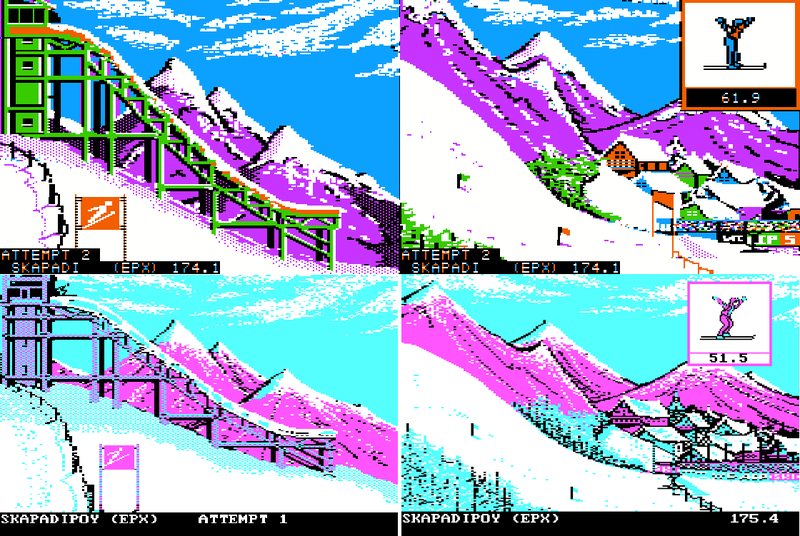 The DOS version has a similar style, but because of the CGA palette, is unable to make the mountains relatively unnoticable. On the NES version, everything is squeezed up again, making the overall look awkward. This also has an effect on the character animation, which has been made to look unnatural in the environment. Also, the tower rising from the midst of the audience looks more like a door than a tower. Unsurprisingly, you witness the patterned look that so many NES games are saddled with once more. Continuing with the default look, the NEC version again gets closest to the original, but has some minor colouring differences in addition to the obvious interlaced mode. The Apple ][ version again has a slightly different look, but although the colouring is more derived from the original, the animation leans more towards the Spectrum and MSX versions, which are coming up shortly. For something completely different, we have the Atari 2600 version with a brilliantly simplified look, although the playability is similarly altered. Honestly, I can't say it looks good, but you have to love the Atari 2600's limited ability and the charm it oozes. 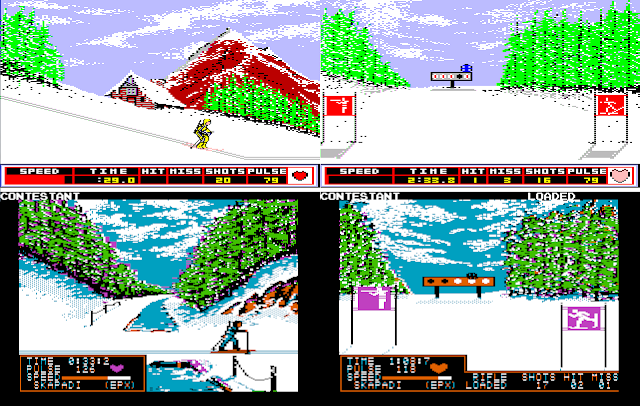 Taking the wintery theme into an extreme, the MSX and Spectrum versions have the background mountains coloured in a blue-and-white fashion, making the game feel more mid-wintery than spring. Not a bad choice at all, but they do have a slightly garbled look, if you bother to take time to look at it closer. What draws the two apart is the player sprite - the MSX version has a red man with black outlines, and the Spectrum version has a white man with blue outlines. Neither of them are too bad to look at as such, but the animation has a strangely angular feel to it, as I mentioned before. Although I prefer to look at a more clearly differently coloured sprite in action, it's clearly a matter of preference, and I will have to make these two share the score. The Amstrad version, on the other hand, looks completely different again, and because of the colouring, bad resolution of all the graphics and the flying curve in the animation, it is very difficult to look at. Not recommended at all, although it is nice to see some trees in the background for a change. 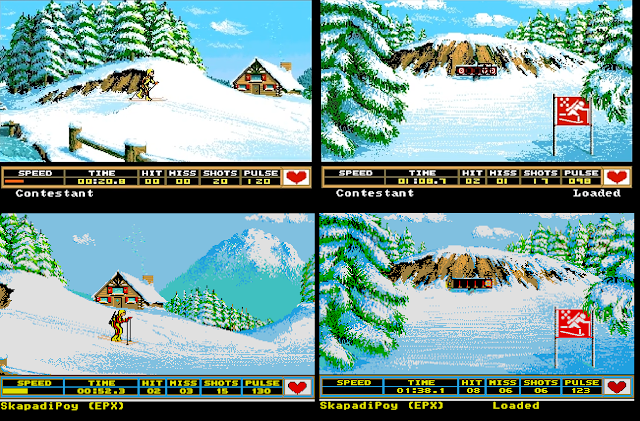 Screenshots from Amiga (left) and Atari ST (right). And then the two 16-bits. Both of them are extremely nice to look at, although I do prefer the more busy look of the Atari ST background, having some green elements instead of a strictly cold, hard wintery background. But again, since they both act similarly in animation and in essentials, it's really a matter of preference. Although Biathlon is the most time-consuming event in Winter Games, it doesn't feel nearly as long as either of the figure skating events. This is due to the variety in action and some picturesque graphics to go with the frantic biathleting. There are two majorly different variations of this event - the Amiga and the Atari 2600 versions. Both are quicker to finish, and both have something graphically unique: the Atari 2600 has a top-down vertically scrolling ugly variation, and the Amiga has a beautifully scrolling varietal of the original setting. 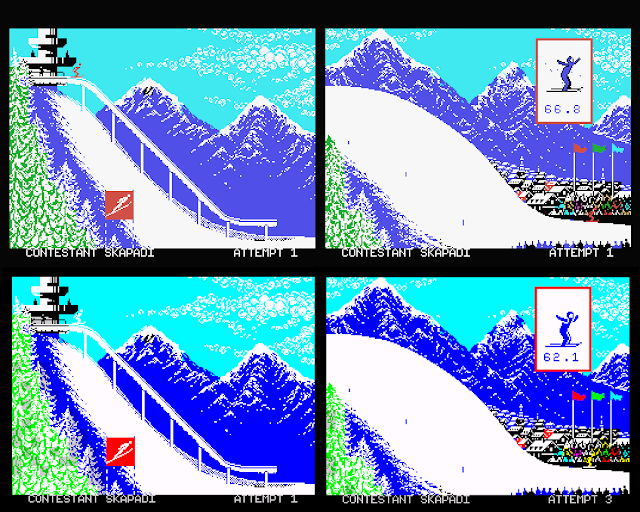 Starting again with the C64, we get a clearly different screen for all three skiing screens, although you can only see the third one here, because it's the one that has been mirrored in some versions from the previous picture. The Atari 7800 version has had this detail copied from the C64, but has much less colour and detail - most importantly, the flowing water in the bridge screen. The NEC and Apple ][ versions follow suit as far as the sceneries go, and the NEC version even takes the detailing as far as the water flowing under the bridge. Too bad all the animations are slightly flickery. Colour-wise, the NEC version is probably the closest to the original of all conversions. Other than having the two screens with hills in them being each others' mirrored images in both MSX and Spectrum, they look quite nice, with all that clever use of shading and hi-res graphics. 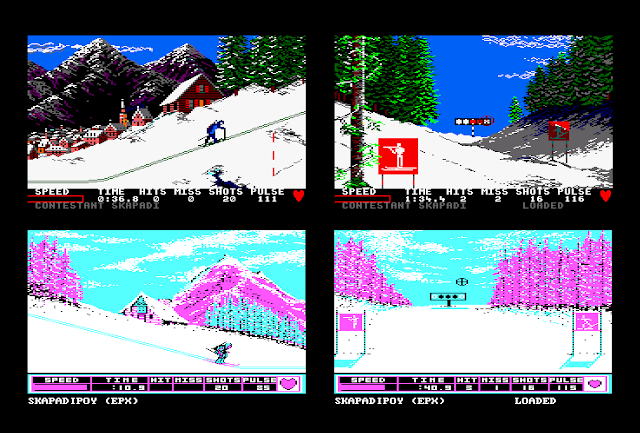 I do think the skier looks better on the MSX, but otherwise, there's not enough differences to tell them apart from each other, and so it really is a matter of preference again, whether you want your skier to have black outlines or not. Although the Amstrad version clearly takes on after the Spectrum and MSX versions structurally, the graphic style is more low-res, but colourful. The village in the background, as well as the mountains and the forest, look exceedingly atmospheric, as well as uniquely styled. Too bad the Amstrad version of the event plays horribly bad. That is the exact opposite of what the DOS has to offer: brilliant gameplay and badly coloured, yet acceptable graphics. I felt that the Atari 2600 version needs to be viewed as its own entity, because it really is such a singular display. You really have, almost literally, nothing to see in this version, and it seems to only act as a sort of placeholder for anything better, but was left in the game by mistake. Apart from the shooting bit, it plays really badly as well, so I can't really understand how this is any better than figure skating in this instance. On this occasion, I like that the colouring is more subtle and smooth, and there the Amiga takes the lead. It's a double-edged sword having a scrolling version of the skiing bits, because it feels a lot smoother and more picturesque while skiing through the area, but then again it definitely makes the shooting range bits feel slightly out of place. Still, as an overall graphical presentation, the Amiga version beats the ST by a hair's width. On another note, more to do with playability really than graphics: both the 16-bit versions have the middle, or starting bit different than in all the other versions - you start from between a downhill bit and an uphill bit. However, I thought this was not enough of a difference to be mentioned in the playability section, so there it is in any case. Some will like to have some variation, some will hate it, but I'm all good with that. So, make of it what you will. 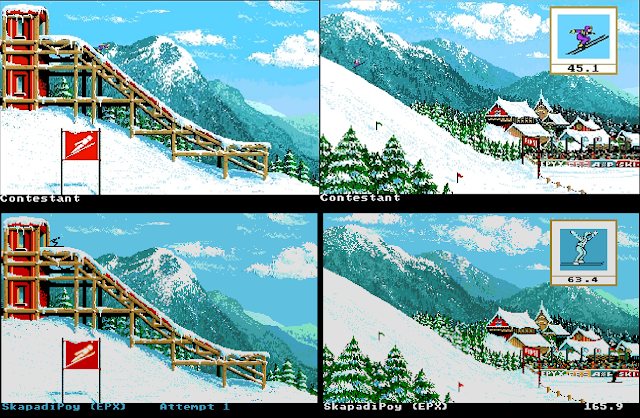 Starting line / middle screen differences in the 8-bits, as presented in the C64 version (left) and the 16-bits, as presented in the Atari ST version (right). Although this event has much in common with the two figure skating events in that most of the screen is filled with one colour - which is that of the ice, there is a surprising amount of differences to be found between the 12 versions this event has managed to get itself done as. Then, of course, the skaters all have their own slightly different look in detail, colour and animation. Even the snow mounds that separate the two lanes have their own distinctive look on all releases. Starting with the two 16-bit versions, we see that they have a very similar look, only the Atari ST has a slightly darker hue (although it probably has something to do with the emulator settings), but it has been made less noticable by colouring the screen borders the same as ice. Then, as the perfect contrast, we can see the amount of detail that has been put into the Atari 2600 version. Very much less of everything, and you aren't even able to see the other player's lane in your own screen, which probably helps with the processing. Luckily, it works fantastically, but you would sort of expect that from Atari 2600. At the right end, the NEC version suffers from the interlaced effect worse than ever, although it's not really that bad in action. Otherwise, it's very close to the original, as usual, only the distance markings that come every 50 meters have a strangely unimaginative look to them, having the basic font and no actual signs. Now, the C64 screenshot there looks kind of dark, but it's really my fault for choosing a certain emulator and its particular palette for taking screenshots. 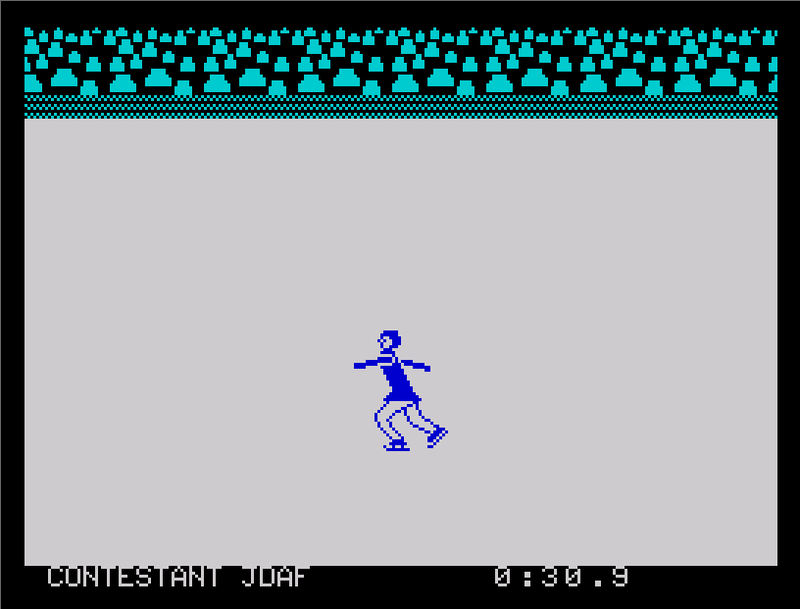 On a real C64 setup, the red and dark blue colours are much clearer on the two skaters. That said, it still doesn't look all that ice-like, but the animation is fantastic and everything looks as if it was made by a person right for the job. The DOS and Atari 7800 screens lean more towards the ones below in their colouring, but the animation and the amount of detail are more based on the C64 original, only the Atari has a slightly blockier look. The whitest screen with the awfully blocky graphics is taken from the Apple ][ version, which doesn't come as a surprise. Somehow, the amount of detail is closer to what the Atari 2600 has, instead of what its closest competitors in hardware have. Strange. The funny thing about the NES version is that even with such a little amount of graphics on screen, you can still see that the background elements are made of tiles. Also, apart from the distance markings, there is no variety in the length and look of the snow mounds separating the two lanes. The skaters' animation is too quick and similar on both sides to notice which side you are skating on. Still, it's fast, which is a good thing, unlike the three versions next to it. All of them are insanely slow, and because the screen scrolls so slowly on each version, they have decided not to put any distance markings between the lanes, and instead have gone for a more detailed distance indicator below the action screens. This way, you don't have to skate as long on screen, although perhaps so in time. The skaters' animation is slightly awkward, in that without the white stripe, you would have a very hard time knowing which foot you were on. This is where the Spectrum version gets beaten, although you might as well just guess which way you should waggle your joystick. The Amstrad version has the most colour, but there is just too much red on the screen, so the MSX version is the one I would go for, because it's the best compromise. But all three are better than the NES version, because it's the most boring to look at. There is not too much to look at in these two events, particularly as they both look exactly the same. You are dancing in the middle of an automatically scrolling screen, which consists 70% of ice, which in most cases is white or some other shade of it. What you do have to be looking at for 99% of the time is your dancer, whose movements are critical to follow so you can land your lutzes and axels with grace. Otherwise, you only have the varyingly drawn people in the audience and the flags on the walls to look at. On the C64 and DOS versions, the audience looks like randomly placed pixelfigures that might or might not have a resemblence to human forms, but at least it's all done in a nice mixture of colours. The flags look nice and recognizable, but not too high in quality in both, except the DOS's CGA graphics make them look inverted. The dancer has a similar animation and clarity in both cases, but the C64 dancer has more human-like colours. The NES version has the best colours of the three, but again, the background is clearly made of blocks, and as mentioned earlier, the animation of your character is horribly choppy and severely lacks in important frames. For a change, these three have a very similar look. Clearly the Amstrad version looks the best, having all the same traits as the MSX and Spectrum, but having some colour as well as some faces and detail on people, not to mention a better rendition of the Epyx logo in place of the flags. However, all these three share a problem of having no shadow under the dancer, which makes timing the landings immensely difficult. That earns a big minus for all three. And then, as a unique feature for this particular event, the 48k Spectrum version hasn't even got the Epyx banners, and the audience looks even less like people, than what the look on the 128k version. As for the rest of the available versions, the NEC version is again the closest to the original, and for once doesn't suffer that much from the interlaced mode. 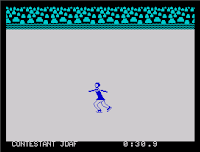 The Apple ][ version has the least amount of background, and the dancer's animation is almost as bad as on the NES. The two 16-bits both have some interesting things going on for them: both have a good variation of the flag setup, although of course for us Finns, it's incredible to see our national flag in a game of this age, particularly as it doesn't exist on any other version. Of course, the same could be said of the Swedish flag on Atari ST version, and many other flags back and forth, so I cannot with good conscience give any extra points for that. The camera has been placed a bit closer and in a slightly different angle on the Amiga, and the audience looks to be closer, but then the ice, which takes so much space from the screen, has been rendered entirely different on the Atari ST, and it looks beautiful in action, and I think that is what ultimately counts here - making the screen enjoyable to look at. Now, here we have the only event of the game that takes place on two screens. As primitive as it now seems to have even a scrolling 2D ski jump game, back in 1985, this was the coolest thing since Hot Dog Aerials. Graphically, the main differences are found in colours and the shapes of the jumping slope and the landing area, but naturally, there are also some notable differences in details. Let's start with the original again, since it's the one most of us is the most comfortable with... presumably. Again, we are presented with a fairly similar backdrop as we had in Hot Dog Aerials, sort of spread into two screens. The jump tower looks dark and menacing, with a red and snowy slope forcing you down. At the bottom, there you see the Olympic town behind the audience area, with some green forest bits surrounding the ski jumping hill. I must say, it's a very scenic view. The player is represented as a black stick figure on skis, and we get a close-up of the skijumper for fixing his posture, where the quality and quantity of animation frames gets immensely important. 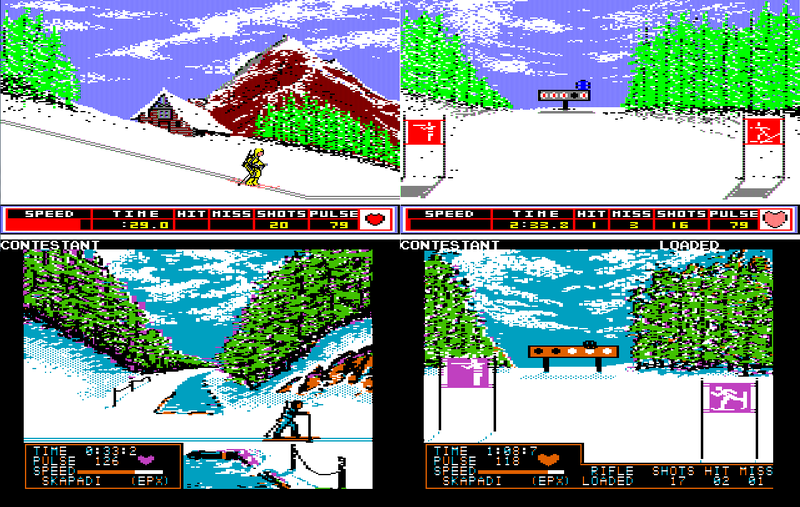 Comparing it now to the Atari 7800 version first, we can see the basic graphical setup is very much the same, only just a bit less colourful, and the close-up of the skijumper is not very hi-res, as it is on the C64. Once again, the Apple ][ version looks extremely awkward, but fortunately, it has no effect on the gameplay. Instead of a metallic grey jump tower, the Apple ][ has a green one, with purple mountains, instead of orange as they were in Hot Dog Aerials. I suspect this decision in colour change was made due to the slope being in orange - it seems as though the Apple ][ palette is devoid of proper red. Being blockier than average doesn't help, either. Well, I can't say the DOS version looks much better due to the CGA palette, but it helps that the shading and details have been taken directly from the C64. It is just that much easier to look at because of the clever use of the few colours available. No surprises in the NEC version for looking very close to the original - only the lack of shading is noticeable, additionally to the obvious, of course. The Amstrad version, however, looks like from a different game. The jumping tower looks entirely different, and there is so much more forest and mountains in both screens. There's even another tower in the second screen, and I have no idea what it's supposed to be there for - perhaps someone more expert in real Ski Jump could explain this? Strangely, the people in the audience look to be similar in size as the player, although they are supposed to be further back in the picture. Something just doesn't feel right here, but nevertheless, it's an interesting variation. Too bad it has that familiar Amstrad blockiness to ruin it. And yet again, these two have such a similar overall look that I just can't decide which one of them is the better one. The Spectrum version has more clever use of shading in bits, while the MSX can boast of having a better main character as both the tiny one and the close-up one. The mountains look better in this event than in Hot Dog Aerials, but I still think blue is an odd colour for a mountain to have. It's the lack of detail and structure that I find so uninviting in these two, but I suppose in this case, less can be more, if more cannot be handled as well as less. For a change, the two 16-bit versions have an almost exactly similar look to them. The only actual difference that I can find is the stick figure, which looks like a tiny real man on the Amiga, wearing the purple outfit as he does in the close-up, and the Atari ST version has that familiar black stick figure. Actually, the black stick figure is easier to spot in the more graphically heavy spots, so in that way it is definitely better. But the properly clothed one definitely looks better, if you take it as a separate entity, and not as part of the game. In the end, it matters very little, if it's black or purple, because you will learn to see it, whichever version you choose to spend more time on. Both of the versions have absolutely gorgeous backgrounds and wooden structures, and it's one of the rare times that I might load up a game just to look at some pictures. Finally, we take a separate look at the Atari 2600 version, which looks exactly like you would expect it to: a spread-out version of the earlier Hot Dog event. There really isn't much to see here, but then you wouldn't expect there to be. The most interesting bit here is the close-up picture of your skijumper - as you control his skis and body separately, it looks unbelievably silly, and is definitely worth a look. Of course, this one cannot be compared to anything, but it's fun because it's bad. Originally the final event of the game, Bobsled certainly ends the game with a bang. Apart from the Atari 2600, all the versions are essentially the same regarding the graphic output. Your bobsled seems to be animated very similarly in each version, only the 3-dimensional tube has some small differences in execution. Also, the map, speed meter and timer screens have mostly the same idea, with only minor differences in detail and colour. Naturally, the 16-bit versions are the smoothest and most colourful, but not by much. Again, the Amiga version looks colder, but also as if the sun was shining straight from above, as opposed to having some nice shading as the Atari ST version does. But since the quality is the same, it's really a matter of opinion again. On the MSX and Spectrum, the graphical setting is the same, having more hi-res graphics, but less detail and things to look at. And as mentioned before, the 3D animation of the tube is a bit iffy, with no time to react to the curves and having to rely on the map screen. The lower right section of the screen looks silly and primitive compared to the other versions, and U.S. Gold is clearly proud of this. When it comes to being primitive, you can't really get more that than with the Atari 2600. You get a top-down view of a few meters of the track, scrolling down as you go. Below the action screen is the speed-o-meter that expands as you accelerate, and the timer under it - and no map screen at all. Next, the Amstrad version, which has a similar attention to detail as the MSX and Spectrum versions, but has worse graphics and no speed-o-meter. Back to the more familiar look, the NEC version with its trademark interlaced mode is once more taking the same route as the original version, only with a more stylish timer font. Too bad the animation is still quite choppy. And then as expected, the strangely squeezed up NES version, with a mish-mash of the worst elements imaginable: slow scrolling in the 3D tube, backgrounds made of tiles, useless information, no attention to detail and lots of unused space. They could have made it so much better, but no. At least the player character looks nice. Finally, we take a quick look at the two unique events for the Atari 2600. Luge is basically a copy of Bobsled in every other way, but the track is different and the sleigh you are controlling contains only one person, and he's lying down on it. Slalom looks almost exactly like Biathlon, except you get some flag gates to go through, and a cabin at each end of the track. I can not honestly say they offer a lot of new things graphically, but I just might honour them with a bonus point. Okay, let's see what happens if we try the traditional calculated total scores. Actually, I'm quite happy with the results, except for the Atari 7800 version being where it is, because it's only there for having not enough events. Otherwise I would place it somewhere between C64 and Spectrum/MSX. It would be useless to try it with the same scoring system used in the previous section, because of the 16-bits, but I shall try to give it, as well as the rest of the lot, a fair scoring. Keeping in mind that this game was originally made in 1985, when most C64 programmers' sound skills weren't quite up to the standards that they were to become only a year later, there is still a very impressive library of sound effects and tunes in this game. But still, as the sound department is not such a big part of Winter Games, some allowings have to be made for some of the versions. assume it's an original tune. Fire; Speed Skating is the worst one, having only 6 bars of quickly repeating electro madness with no redeeming melody; Ski Jump has a very Schwarzeneggeresque action movie kind of a thumping tune; Free Skating tune could have been another Irene Cara hit song from a dancing movie; and finally, Bobsled is the only one that sounds like it really belongs in a C64 game, most likely in an early Gremlin Graphics game - but it's only a fraction of what you would expect. All of these tunes have one thing in common - they are made for being there as suitable fillers before you play the events, and so they are mostly very short with an endless loop, much like what you would expect from a Nintendo game. When it comes to the sound effects, there is a good amount of them to go for all other events apart from the two dance-skating events. Hot Dog has some well-made sounds to go with the skis hitting, taking off and sliding the snow, and 3 different effects for each type of trick. Biathlon has nicely timed skiing sound effects, mixed with your constantly altering pulse and the occasional water flowing sound, and when you get to the shooting range, your pulse is accompanied with the loading and shooting sounds of your rifle. Speed Skating has a similar sound effect throughout the event as Biathlon has for your skiing (of course without the pulse). Ski Jump has an appropriately altered sound from the Hot Dog event for taking off, as well as for landing, but here a fall is noted with a slightly different effect. Bobsled sound is mainly two types of skating noise, sliding to a different pitch when going through a curve, and one other effect for when you fall over on your bobsled. In any event where you get scored by a panel of judges, each given score is marked with a little tick-sound, and if you have performed particularly well, you will get a nice crowd cheer noise with some whistling. Figure and Free Skating only have their respective songs to hear, in addition to the judging sounds. Overall, it's a very rich and well-produced sound environment. Mostly, this particular version of the soundtrack sounds surprisingly much like the original, although naturally it has the ST's own characteristic overall sound. Some of the sound effects are more pronounced than in the original, and some of them sound slightly more realistic, which is not a bad thing at all. Perhaps it's not quite as subtle in all the tonal expressions of the musical score, but I do think that in most places, it is overall just that bit better than the C64 version to earn a higher spot in the comparison. Again, the Amiga version gets a similarly rich set of sounds and music as the original and the ST versions have, but it just has a more powerful and natural overall feel to it than any other version. Then again, it's also slightly darker than the soundtrack on Atari ST, but it's really a matter of adjusting your mixer settings. The only thing I prefer on the C64 and Atari ST is the sound for loading your rifle in Biathlon. In Hot Dog, the only thing that has a sound effect is your take-off. Biathlon is missing the rifle loading sounds and the watery atmosphere. Speed Skating didn't have all that much sound effects to begin with, so they have at least managed to get all of that included, and also Ski Jump and Bobsled sound essentially as they should - only some sound types are slightly different, but not too much so. Also, all the judging sounds are missing, from what I could tell. The music very different is in some cases: the Nutcracker tune has been moved to the Free Skating event, and Figure Skating has something completely different: it's two classical pieces put together, one of them being a Bach cantata "Jesus Bleibet Meine Freude", and the other one I can't recognize - could just as well be an original composition made for the game, but if anyone can recognize, please do tell. The Hot Dog tune has been included at the beginning of Biathlon also, which feels very strange, and the proper Biathlon tune is completely missing. Ski Jump has the correct music, although it has a very pronounced delay effect in the melody, which takes away from the beauty of it and creates a slightly more chaotic feel to it. Speed Skating has a different, much chirpier tune, but it wears down just as quickly because it's of a similar length. I do prefer this one over the original, though. The tune for Bobsled has a problem with phrasing - most of the melody plays too early, and the arpeggiated chord changes sound silly in the background. All of these three have the same sound sets and music, but the 128k Spectrum has just a bit more to offer than the others. Additionally, in the Amstrad version, all the tunes have more pitch and tone problems as a bonus, making it less pleasurable to listen. The 48k Spectrum version has some more differences than usual in the tunes. For example, Bobsled music is played at the beginning of Hot Dog, Ski Jump has a completely unique rock'n'roll tune which would belong nicely in a version of Street Rod, and the second half of the game seems to have no music at all. Also, all the sound effects are completely gone. Having a one-channel beeper in both cases, the sounds aren't very mind-blowing at all. The amount of sounds are similar to what most of the 8-bit conversions have, but are less realistic, and the music is horrible to listen to. At least it's a lot more than what the 48k Spectrum has to offer. The Apple ][ version gets just a bit more points for this, because it has some more variety in its set of beeps and noises. At least, the NES version gains some ground in this department. Although the few tunes that it has aren't all that well executed, at least there are a better range of sound effects than most of the other 8-bits. The rendition of the tune for Speed Skating, though, is beyond horrible, and almost deserves a minus point. Another version with only four events, it really suffers from a lack of presentation. Biathlon has a very one-sided set of sounds, being only different variations of the same noise, and no music at all. Same thing with Speed Skating, Ski Jump and Bobsled. The only piece of music you can hear on the Atari 7800 is played in the opening ceremony. This is one thing the two non-16-bit Ataris have in common: the only tune you will hear in all of the game is the opening fanfare. Interestingly, the A2600 has a more varied set of sound effects than it's elder brother, featuring some funny blips and blops added to the regular set of noises. The least familiar version gets to be the last one to have the final playthrough. NEC's FM sound system has a very midiesque overall feel to it, although it's not quite as stingy. Plastic is certainly is. Starting with the opening fanfare, it's a very nasal and somehow rough version of what it's supposed to be, feeling like it was left slightly unfinished. Everything else, though, sounds very much like they are supposed to, bar the plastic midiness of everything. All of the correct songs are in there, and all the sound effects are in there as well, in their own way. 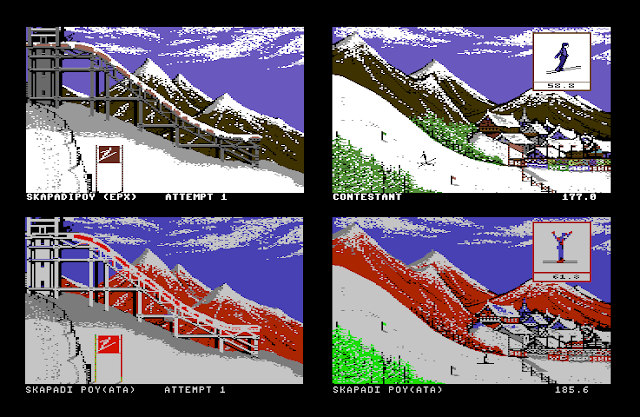 An interesting point to consider regarding Epyx's Winter Games, is that according to the manual, the game "takes place" in Calgary, 1988. Of course, this hadn't happened yet, so it could only have been based on the idea. Also, since Epyx had no official license of the IOC for any of their sports games, it's not too much of a wonder that some basic events were missing and some were extra, etc. etc. 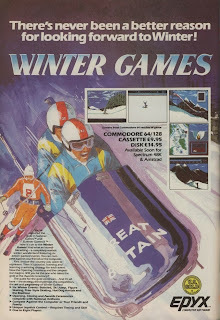 Had the event list in Winter Games been exactly according to the real 1988 Winter Olympics, there would have been only one Figure Skating event, some more skiing events (one of which was included on the Atari 2600), Luge (ditto), and Ice Hockey. 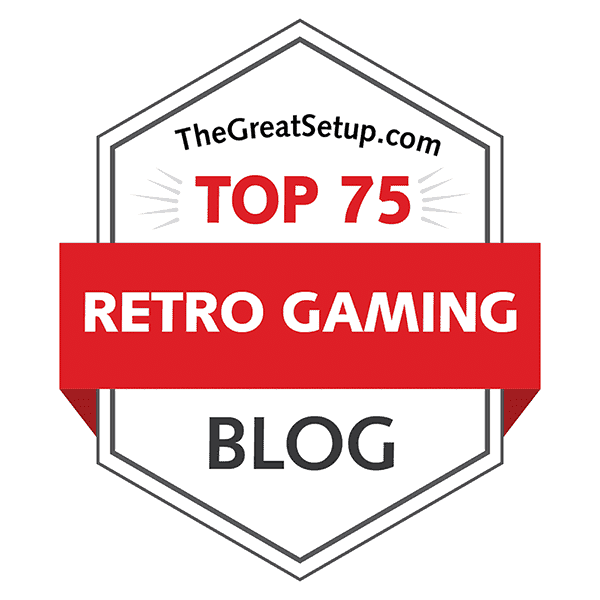 Whether or not it is to be considered a good thing that we got what we got, is entirely up to us retrogamers. I, for one, am perfectly happy with what we have, except for the two dance-skating events. Calculating the overall-overall scores has never been this tricky, mostly because this is the first time I'm doing a thorough comparison on a multi-event game on such a diverse array of machines, that some of them don't even feature the same events, nor even the same amount of them. Therefore, I have had to add some points for the Atari 7800 as would have been plausible, had it had the other events included; and even the NES version for all the uselessness it has proven to be, has earned an extra point for the graphics department just for the thought that if it had had all the events, it could have beaten the Atari 2600 in that regard. I don't really know how to be fair in this situation if this is not the way. Wow, what a comparison. So many events, so many machines! An epic accomplishment. Nice hearing how all the versions compare. Never guessed there was an Atari 2600 port, quite amazing. An enjoyable read, very apporpriate for the season as I look outside this morning to boundless snow. This is the kind of comparisions I do love! I love when combining different platforms/console/machiens and compares each other in a big review, just the way you have done! Fantastic job, man!!! An amazingly comprehensive comparison, though I think you're a little harsh on the Apple II graphics which I find oddly appealing. But overall, I agree that the C64 original and the two 16-bit versions look the best. I had almost forgotten how scenic, and truly BEAUTIFUL, the wintry landscapes look on the Amiga. Well, I just write my experiences and the way I feel about the graphics (as well as gameplay and sounds), which may or may not be better or worse than in other versions. All I can really offer is my point of view in as educated manner as I possibly can. If you like the Apple graphics, you are able to appreciate something that I am not as much. =) And yes, I actually learned about the music later on, and wrote about it for my comparison of Summer Games - I was only too damn lazy to fix it here. =D But again, thanks for the comment! 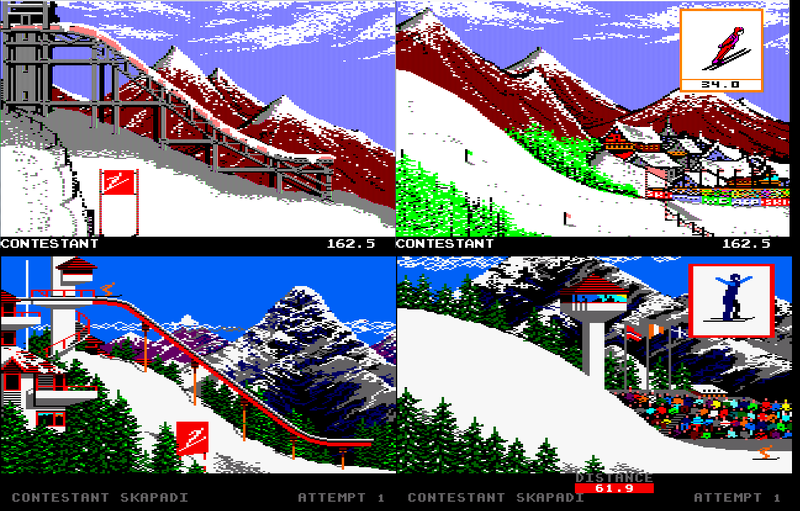 I find the building and the tower in the Amstrad ski jumping screens, maddeningly attractive and I would like to see a game where they are used in a more interactive way. On a more serious note, the C64 sprites har among the best ever done for the system. Especially in speed skating, hot dog.